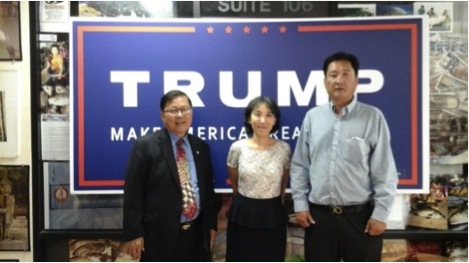 “Korean-Americans for Trump,” which has a website and a private Facebook group consisting of Korean-Americans with similar pro-Trump views. Shin, who spoke at the 2016 Republican National Convention, proclaims that the group is a “minority within a minority,” but some fellow supporters don’t quite see it that way anymore. “Some of what I hear from first generation Korean-Americans is, ‘Why should I feel bad for these people who came illegally?’” Cho says. Cho also draws a line between the perspectives of the Korean-American community and those of the Latino community. “We are already here,” Cho says. “The number-one issue for us is American issues, not issues like immigration like for people in Latino communities. The Koreans who are worried about immigration still live in Korea. If you’re already here, you’re not going to be impacted by immigration law. You’re already here. You’re already an American. Tina Melton, a Korean-American Trump supporter who works in Maryland Governor Larry Hogan’s Office of Community Initiatives, voted for Barack Obama. She and her family immigrated to America when she was four years of age. “Now that immigration is such a big issue for Trump, I feel that the immigrants are being forced to be in this identity politics just because we’re immigrants,” Melton says. In March, Melton was part of a group that lobbied against a sanctuary bill—one that would establish a safe-haven of sorts for unauthorized immigrants—in Howard County, MD. In May, the New York Times ran a story highlighting the “surprise foe” of sanctuary bills in Maryland: legal immigrants. Politics back in Korea play a role as well. Cho adds a claim that among first-generation Korean-Americans, Trump support is rampant due to his handling of the North Korean situation. According to Itak Seo, who is set to be the next president of KAAC, the value of local business to the Korean-American population and Trump’s appeal to business owners are a natural match. “The stability of the economy in the Korean community is not in a good state, especially beauty businesses, dry cleaning businesses—those businesses are going down,” Seo says. “In Trump, people are expecting some type of improvement in every industry. The Korean community thinks that’s the proper way of managing the country. While Cho and Tae Kim indicate that Trump support is surprisingly widespread in Korean-American communities, data still illustrates that 70 percent of Korean-Americans identify as Democrats. However, Trump supporters like Andrew Suh, could be indicators of a trend. A 27-year-old data analyst from Philadelphia, Suh is a registered Democrat. He voted for Bernie Sanders during primary season but shifted to Trump for the general election. He says Trump’s “America first” message appealed to him as a part of a community where many of his friends are small-business owners. He considers such social justice issues as race relations to be over-covered in the media. Post-election polls have indicated Asian-Americans’ support of Hillary Clinton. An Asian American Legal Defense and Education Fund poll reveals that, of 14,000 Asian-Americans polled, 79 percent voted for Hillary Clinton in the 2016 race, with only 18 choosing Trump. Of that number, 84 percent of Korean-Americans selected Clinton and 14 percent Trump. But Cho, who admits she voted for Trump only because of her distaste for Clinton, senses Republicanism among Korean-Americans may be on the rise. “If [first-generation Korean-Americans] come to realize that it’s Republicans who support lower taxes, it’s Republicans who are against unions, that Republicans are less supportive of LGBT, then I guess it can shift,” Cho says. Amina Khan, an Indian-American lawyer in Chicago, is anti-Trump. But looking at her Indian father who voted for Trump, she opines that members of different minorities voting for Republican candidates represent a goal of Americanization, one that applies to Indian-American Trump supporters as well as those to those in the Korean-American community. Joseph Kim recognizes that Korean-American—and, in general, minority—Trump supporters are statistically a minority, but he senses that they are a rapidly growing one.